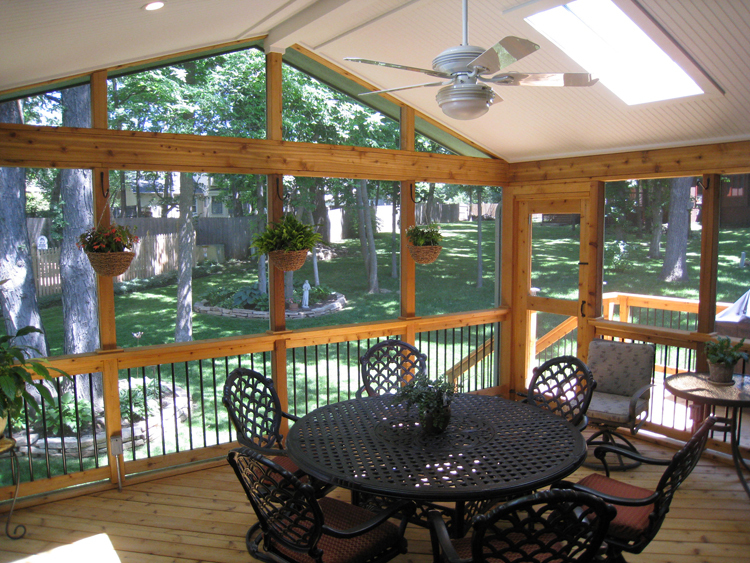 This Overland Park screened porch has enclosed rafters along with lighting, a ceiling fan and skylights. 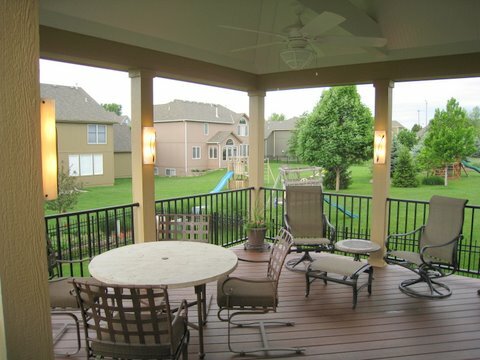 At Archadeck of Kansas City, roofed structures have become one of the more popular structures we build. This is likely because there’s so much more outdoor living that can be done with a roof than without a roof. This reminds me of Beyonce’s song when I tell my customers that if they want to do more outdoor living, well, they just have to put a roof on it. While decks and patios are the perfect place for eating, relaxing, and gazing into your backyard, they don’t provide sun protection nor protection from rain and other falling elements. Here are some of the additional benefits you get when you put a roof on it. If your furniture is under an open porch, it will have a good amount of sun protection and will also have some protection from rain. This opens up more options for your outdoor furniture. But even more options are provided when you add screens. Screens provide a fair amount of protection against rain and also provide protection from falling debris such as leaves. Today’s outdoor furniture weathers the outdoors much better than it used to. furniture. But, in the harsh sun and when rained upon, outdoor furniture will not last as long or stay in shape the way it will under a roof or in a screened porch. When you’re considering which paper plates to purchase for your upcoming barbeque, do you consider whether you’ll need something to weigh down the plates because of the wind? Do you need to make sure all your outdoor serving pieces have lids because of the bugs? When your outdoor eating area is on a screened porch, you don’t need to worry about these things. In fact, you can likely feel comfortable using your indoor dishes. There are more options having neighbors and friends over for dinner or coffee if under the protection of a roof or behind screens. You can still enjoy the sounds and smells of outside. You can still enjoy the fresh air. But, there are no worries about a leaf falling in your cold drink or about an early evening get together will be quickly shut down if the mosquitoes are biting. With a roof, you also have the option of having ceiling fans for better air circulation. There is a distinct difference between a deck or patio and a roofed structure. It’s hard to put your finger on what that is but it just feels differently. Perhaps it’s the feeling of protection that a roof provides. Perhaps it’s because you can do more indoor activities outside. But by putting a roof on it, you can do more living outside. Outdoor living often becomes much more enjoyable with protection from both sun and bugs. If you want to enjoy a lot of the benefits mentioned above, then you may need to put a consider a roofed structure. If you are considering adding a new screened porch or open porch to your Kansas City area home, give us a call for a free consultation at (816) 228-3325 or drop us an email. This entry was posted in Covered porch, Open porch, porches on October 2, 2013 by archadeckkansascity.